The theme for this month's Wine Blogging Wednesday was suggested by Tim Elliott over at Winecast, His pick: Old World Rieslings. I just happened to have one handy and it turned out to be a good one. 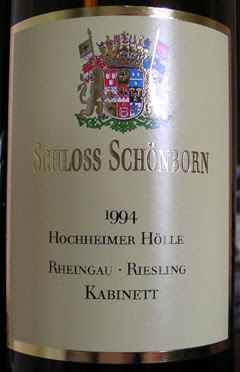 The 1994 Schloss Schönborn Hochheimer Hölle Riesling Kabinett was a mouthful to say (I wouldn't even attempt it) as well as to drink. This particular bottle came from Garagiste and set me back $11.99. That's an outrageous price for something this good. Note: this was purchased in the latter part of 2007 so we're talking $11.99 at today's prices, not back in the 90's. The light medium-gold color gave no indication of a nearly 14-year old wine. It took a lot of swirling to get the aromas to open up and even so, they remained reticent. I detected petrol and rubber/auto repair garage notes, as well as green apple. The palate was much more flavorful: Mainly succulent apples backed by fresh, crisp acidity that led into a long finish of green apples, lemons and limes. It had excellent balance and concentration. No way did this wine seem that old! The only negative was that the aromas never did open up that much but for the price, this was a real bargain. Two thumbs up. Here's the matching YouTube music video for this wine. If you can't see it below, please click here. 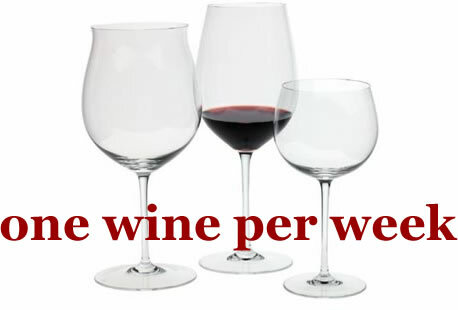 Your wine sounds like a great deal and your musical accompaniment is right on the money. Thanks for participating. Now I wish I'd bought that--I passed on it! Thanks for the comments, everyone. For the price I couldn't pass this one up! Well worth every penny and then some.